The recent history of Podere Brizio is almost as tumultuous as that of Montalcino itself! The estate as we know it today was created in 1996 by Roberto Bellini when he sold most of his stake in the Pieve di Santa Restituta property to Angelo Gaja. Bellini, who had managed Pieve di Santa Restituta since the 1970s, claims to have retained the best hectares of Pieve for himself in order to create Brizio. In 2001 Bellini completely renovated the old cellars; and though the wine was always of very high quality, the irascible character of the owner impeded their commercial success. When we were presented the wines in 2010; we found a treasure-trove of older vintages going back to the late 1990s! It was a dream-come-true moment: 1999-2005 vintages of delicious (and perfectly in-situ) aged Brunello at very reasonable prices. 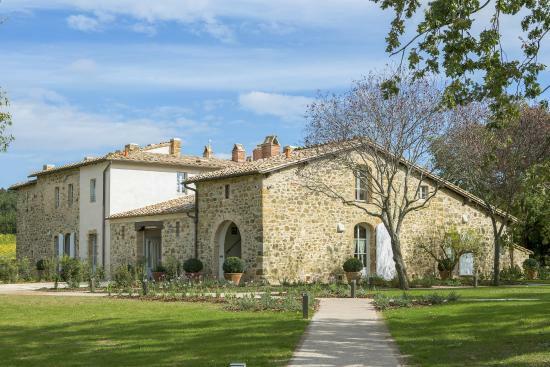 The newfound success of the estate in the US market notwithstanding, in 2013 Bellini decided to sell the estate to Alejandro Bulgheroni, owner of the Dievole winery in Chianti Classico. Bulgheroni decided to revamp and renovate the estate, focusing entirely on sangiovese under the watchful eye of Alberto Antonini. The terroir of Brizio was never in question, but under the new regime the wines have really found their groove: longer fermentations in stainless steel with indigenous yeast, and aging in 54 hectoliter casks has really brought out the elegance from a region known for powerful and long-lived wines. Aside from Angelo Gaja, Brizio's neighbors include the famous Case Basse of Gianfranco Soldera, as well as our very own Mocali estate. The coin that is shown on the label is the Parpagliola, minted 1556, that Bellini bought at auction in Montalcino in the 1970s. It shows the she-wolf suckling Romulus and Remus (a symbol of both Rome and Siena) with the writing "The Republic of Siena in Monte Ilicino." The name of the city we now know as Montalcino derives from the Italian for Mountain of the Ilex (or Holly tree). The coin is a symbol of a turbulent time in Tuscany's history: After the Florentines had beaten the Sienese out of their own city in 1555, the nobles of Siena fled to Montalcino to reform their republic under the aegis of King Henry of France, husband to Catherine dei Medici.